In this video we will discuss, selecting, inserting, updating and deleting data in mvc using entity framework. Please watch Part 24, before proceeding. We will be using tables tblDepartment and tblEmployee for this demo. You can get the sql script to create and populate these tables from Part 10 of this video series. Step 1: Create a new asp.net mvc 4 web application. 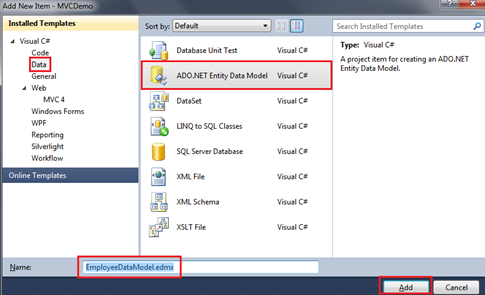 Step 2: Right click on the "Models" folder and add "ADO.NET Entity Data Model". Set Name = EmployeeDataModel.edmx. On the subsequent screen, select "Generate from database" option and click "Next". On "Choose your data connection screen", click on "New Connection" button. 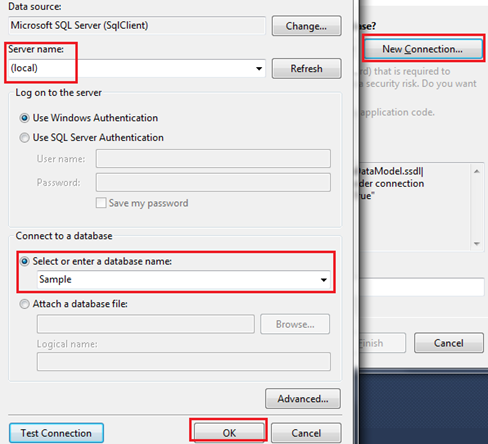 Specify the sql server name. In my case, I have sql server installed on my local machine. So I have set "Server Name=(local)". From "Select or enter a database name" dropdownlist, select the Database name and click "OK". 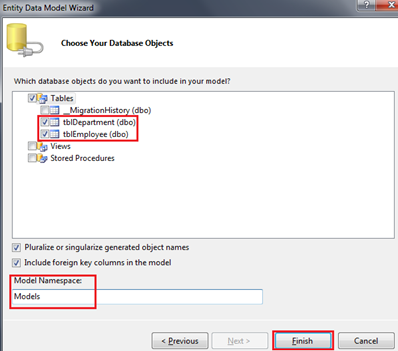 On "Choose your database objects" screen, expand "Tables" and select "tblDepartment" and "tblEmployee" tables. Set "Model Namespace=Models" and click "Finish"
Run the application again. Notice that, all the employees are listed on the index view. We can also create a new employee, edit an employee, view their full details and delete an employee as well. However, there are few issues, with each of the views, which we will address in our upcoming videos. Sir, I am getting un supported context error..my drop downlist for DataContextClass does not list EmployeeContext even if i build the solutiom more than once..please help..
Watch the video, because you need to make EmployeeContext your connection string name, or else use the one called Sample, like on the blog here. For the unsupported context error, upgrade to "visual studio 2013"; upgrading resolved the issue for me. i have visual studio 2013 express version and still get this error. I named my connection string as Employeecontext as well . I have used connection string in web.config but still get the same error. However i included SapmleEntities from the dropdown list of select context and its working. Employee Controller is not generating scaffolding template and code and shows issues with alert. I have closed Visual Studio and opened again with Admin Privileges solved problem. This is for others reference. After watching video and this tutorial . In case you are using visual studio 2010 then you will not get this error. Follow the same step as mentation in MVC Tutorials. I Think IT`s HELPFUT TO u.
http://stackoverflow.com/questions/12256519/entity-framework-issue-in-vs2012-rename-properties-not-sticking, This worked for me, by moving entitydatamodel(employeedatamodel) to root directory, and the tbl prefix has gone. Thanks. Hi Does this auto generation work for mvc3 also? Whats the impact of using entity framework in mvc4 application. Server Error in '/MVCDemo25' Application. Exception Details: System.Data.SqlClient.SqlException: Login failed for user 'IIS APPPOOL\DefaultAppPool'. "Could not load file or assembly, the system cannot find the file specified." Can you help me with this, so i can able to move forward. Thanks for the Videos and the detailed blog on MVC. I tried to generate a Employee controller but it is creating templates for department, Please let me know where i am going wrong. In the tables i took there is no foreign key.Hence i dint get any relationship and also no navigation properties are available....so can i take independent relationships????? Hello sir, I want to know that is edmx file make mvc application slow or not when I have large amount of data in database. Sir, if i Write data annotations in that auto generated class then if i update the model(edmx if any column changes ) yhen all the anotations will go away . what i need to do on that case. how this is coming... can anybody tell. I am setting entity container name as employeecontext. how this option is rising in drop down list. How do I update the entity framework key relation in the code. 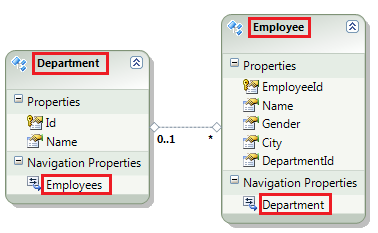 I followed all the mentioned steps to create Entity framework environment in code but later I found that in my database table I didn't have the foreign key relation between Employee and Department table so I have created a foreign key in Employee table referring Department table Department Id but the same foreign key relation is not updated in the entity framework code. In my past interview, the Interviewer asked me about Dependency Injection in MVC. How will you implement? Can you please make an video on Dependency Injection in MVC? sir when i create the EmployeeController this error comes up"Could not find the CLR type For Models.Employee"
Hi Mostafa, this is happend because you have not mapped the Department table ID field-> with Employee table departmentId field. It means this primary key field ID of table Department is not properly related to the field departmentId of Employee table as foreign key. Hope I have given suitable reply. After renaming the entities....i am trying to add the controller but..i am getting this error "unable to retriece metadata for mvcdemo.models.tblemployee". could not find the CLR type for model.emploee.....please help what i need to do...thank you..